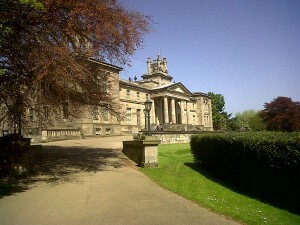 To the Dean Gallery to work in their Archives on Peter Watson. They have some Roland Penrose material which is helpful. Whilst there I look at the extraordinary reconstruction of Paolozzi’s studio. There aren’t many of these studio recreations in the British Isles that I am aware of. 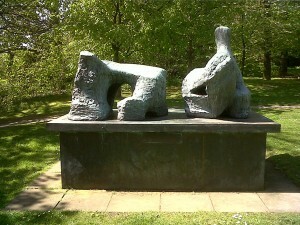 Bacon’s in the Hugh Lane Gallery in Dublin and Henry Moore’s various studios at Perry Green spring to mind. There is of course Derek Hill’s house at Church Hill in County Donegal, but no studio. 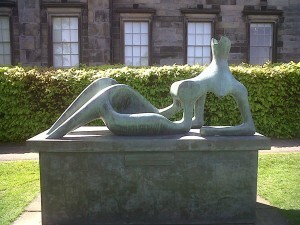 Then to the Scottish National Gallery of Modern Art across the road, with its amazing grass sculpture in front. Also an important work from 1951 by Moore at the front and an extremely well-hidden work by Moore at the back behind some bushes. Seems a poor site to me. The SNGMA can disappoint. Whilst one can see the Scottish Colourists (artists whose works are regularly in the salerooms), their great Colquhoun work, Figures in a Farmyard, is not always on display. In any event, I much prefer Gillies and Mactaggart to Peploe; amongst the Colourists I prefer the work of Hunter. Back in town, the glorious Scottish National Portrait Gallery has not yet reopened after refurbishments. That is always a treat, both building and collection.